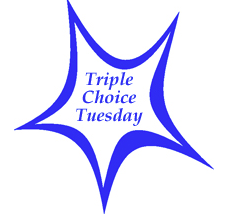 Many of you are certainly familiar with Kim’s (Reading Matters) Triple Choice Tuesday. It’s a feature in which bloggers share their favourite books. If you’d like to find out my choices, please visit Kim’s blog. Great choices–I love Kim’s Triple Choice posts–it’s been a while since I visited so this was a great nudge over there! Thanks, Danielle. Don’t be afraid of the “hoot” factor. It’s not a comedy. It’s more satirical. Oops–off topic, but I have heard Pema Chodron speak (online) and she is wonderful. Yes, she is. This book is great. It contains 108 short chapters that are all so interesting, helpful, inspiring.